Have you seen a lionfish? I’m sure you have. They’re beautiful and graceful with their wistful and feathery fins. Their venomous spines make them even more seductive to me. I could stare at an aquarium and watch them for hours. 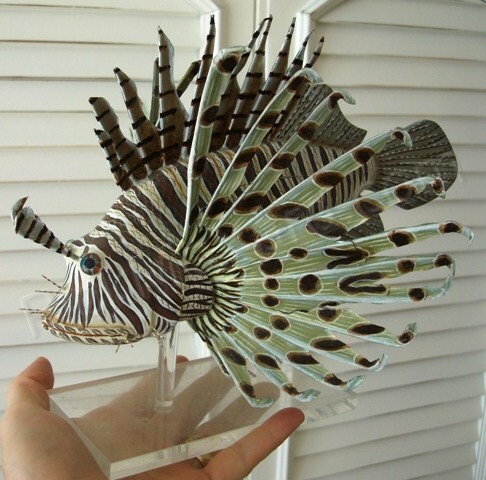 This is my fake lionfish on a stand. So are they lethal if you’re stung? It seems to depend on several factors such as how bad the sting is and the victims reaction to it. If the victim is allergic to the venom then it could be lethal. However, according to the FWC, a sting isn’t usually deadly. 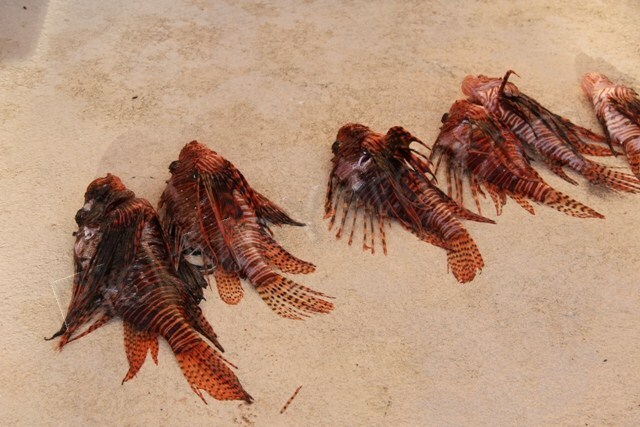 Check out MyFWC.com for some excellent facts on the lionfish (Pterois volitans and Pterois miles). Lionfish are indigenous to the Indo-Pacific region. Unfortunately they were let go in our South Florida waters (probably from the aquarium trade) and are increasing in numbers at a rate never seen before. They will rapidly destroy our marine ecosystem because they have a HUGE appetite for our native fish such as baby grouper and snapper. They’ll soon devastate our fish populations which will affect our algae growth balance. This is a serious problem. Please click here for an amazing slide show with maps on the progression of the lionfish invasion. They have no predators in U.S. and Caribbean waters… except man. And the good news is that they taste super delicious! I highly recommend The Lionfish Cookbook by Tricia Ferguson and Lad Akins. The book is full of easy recipes, great information and loaded with tons of pictures. The book also gives detailed instructions on catching, handling, cutting the spines off with scissors, spearing and of course… the preparation from start to finish with pictures. I bought my copy at Guy Harvey’s flagship store in Grand Cayman, where the lionfish are also a terrible problem. In Grand Cayman, they are trying to assemble teams to hunt down these fish. I’ve noticed lionfish on the menu more and more. They’re being really proactive. This young man in Grand Cayman hunted these fish with help from his father. 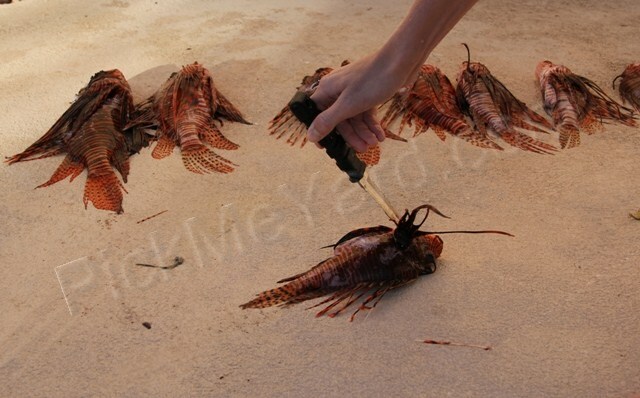 I watched them from shore as they emerged with a bag of lionfish and their spears. Awesome! How do we get rid of them in our waters? There’s no recreational fishing license needed when using a pole spear and no limit to the amount you can catch in Florida (at least through August 2013). It’s always open season for lionfish. If there was a big demand for lionfish meat, then maybe there would be some chance to eradicate them… because there’s no other solution. So go get a spear or find a restaurant with lionfish on the menu.